The Waves browser extension allows to manage private keys and interact securely and seamlessly with Waves-enabled web services and dApps. Waves Keeper is the easiest way to work with 3-rd party applications. Private keys are stored securely within the extension, you do not enter private keys or passwords for Waves-enabled web services and dApps. Multiple different accounts can be added and the user can switch between them effortlessly. Waves Keeper is your secure way to work with applications from the future Web 3.0. 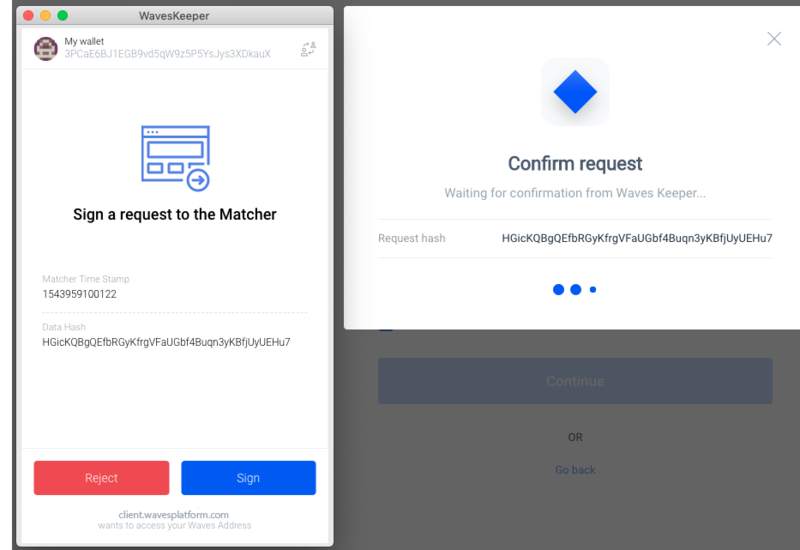 Waves Keeper gives access to your wallet data like address and public key, but only if you want it, and never gives access to your private key or seed phrase. Applications always must request for your approvement. Click button below to give access to your address. How to use Waves Keeper? We recommend to use Waves Keeper with all 3-rd party applications, because it is secure and easy. After installation you will be able to find installed extension at the top right corner. Click on it and click on the Get Started. Accept Terms and Conditions and in the following pop-up set your account password. Password you entered will be stored locally in your browser. Note: password is one for all accounts. You can create new accounts or import with seed phrase. Waves Keeper is designed for convenience, so you can sign transactions with just a couple of clicks. Check out the documentation to learn how to add accounts, switch between them, change settings and use in Waves Client. We highly recommend to use Waves Keeper with Waves Client. You can easily import accounts from Waves Keeper and log in into them. Waves Client will require confirmation for all transactions and orders. Instead of asking seed phrase you can ask users to install Waves Keeper (if they didn't to it yet). Below you can find some details of how you can use Waves Keeper in your application. Waves Keeper injects Waves object to all pages. It is accessible from the global scope in your JS code. You can see the list of available functions on the right side. Functions are mostly async and return Promise. Your application can request user data with auth function. It returns Promise. As a result in the resolve function you can get an object with user data. Note: Always check on your side correctness of the signature for provided public key. With Waves Keeper you can sign transactions of any type with signTransaction(), DEX orders and requests with signOrder(), signCancelOrder() and signRequest() or any plain data with signBytes(). If you have leasing pool and want to make user experience smoother, you can add widget to your website. It requires from user only to input amount of tokens, click a button and approve transaction in Waves Keeper. With Waves Keeper is it really easy for users to make a donation. You can customize widget below and use it on your website.